If you are looking for a high end smartphone which runs Microsoft Windows Phone 8 OS then Nokia Lumia 920 will definitely match your expectations as on the specification front it is fully loaded & packs a great combination of elegant looks and efficient performance. 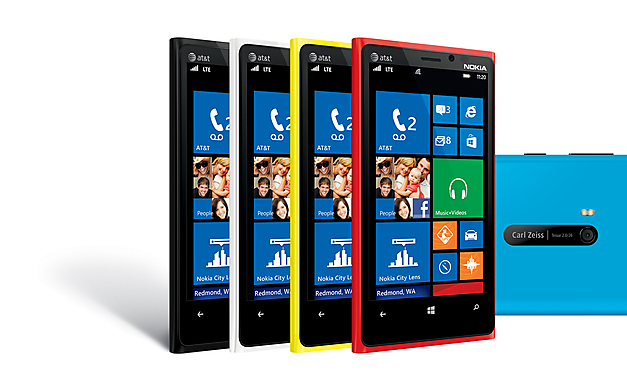 Nokia Lumia 920 is 4G / LTE ready & comes in two model numbers RM820 (AT&T) & RM821. This smartphone sports a 4.5 Inch IPS LCD Capacitive Touch Screen with PureMotion HD+ ClearBlack Display & multi touch. Nokia Lumia 920 is wear & tear ready as its display is protected by Corning Gorilla Glass 2. The display resolution of this smartphone is 768 x 1280 Pixels, ~332 ppi pixels density, 16 M Colours. Nokia Lumia 920 boast of Dolby headphone sound enhancement which gives its users a great multi media hearing experience. Dimensionally this smartphone measures 130.3 x 70.8 x 10.7 mm (5.13 x 2.79 x 0.42 in), it weighs 185 gms (6.53 oz) & there are 5 colour options to select from Black, Grey, Red, Yellow, White. Under the hood this smartphone holds a Dual Core 1.5 GHz Krait Processor, Qualcomm MSM8960 Snapdragon Chipset, Adreno 225 GPU, 1 GB RAM & ofcourse Microsoft Windows Phone 8 OS. The overall technical package of Nokia Lumia 920 is multi tasks & latest games ready. There is only one option in internal memory front i.e; 32 GB & there is no slot to plug in a microSD. The data connectivity aspect of Nokia Lumia 920 is packed with Wifi, Wifi HotSpot, DLNA, NFC, Bluetooth v3.1, microUSB v2.0, GPS with support for A-GPS, GLONASS. To tickle your photographic bone this smartphone holds a 8 MP rear shooter with Carl Zeiss optics, Dual LED flash light, optical image stabilization, auto focus, touch focus, PureView technology, geo tagging, video stabilization. The Primary shooter of Nokia Lumia 920 is capable of clicking images of resolution 3264 x 2448 Pixels & record videos of 1080P @ 30 fps. The secondary camera of this smartphone is of 1.3 MP which can be used for video chatting & this snapper is capable of recording videos of 720 P @ 30 fps. The non removable Li-ion battery has a juice of 2000 mAh. It can be bought online on www.ebay.com, www.clove.co.uk, www.shopping.indiatimes.com, www.knottykart.com.